ClintonKaine.com Sold: Did Trump-Associated Entity Buy It? Home Domain Sales ClintonKaine.com Sold: Did Trump-Associated Entity Buy It? 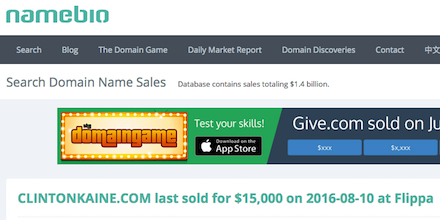 According to NameBio, the ClintonKaine.com domain name has been sold via Flippa for $15,000. I reached out to the former owner of the domain name, and he confirmed that the domain name was sold via Flippa. Interestingly, he told me “[t]he Clinton campaign didn’t want it (they offered me $2000 on the phone).” Devoir Funches, the Flippa broker who helped sell the domain name, also confirmed the sale. At the time of publication, the domain name is now privately registered. When I looked at the Whois information last night, it showed that it was registered to a Parscale Media. DomainTools has an archived Whois record from 8/12 reflecting this ownership information. I sent an email to the listed domain registrant last night asking about the plans for the CintonKaine.com domain name, and I also called this morning and followed up with a second email later on this afternoon. As of the time of publication, I have not heard back. At the time of publication, ClintonKaine.com does not resolve and I have no idea how (or if) the domain name will be used. I previously wrote about the TrumpPence.com domain name, which is listed for sale on Flippa. TrumpPence.com currently has a high bid of $1,001, and there are 19 days remaining in the auction. The undisclosed reserve price has not yet been met though. Thank you to Johnny Rashad for sharing this news with me. Mike Berkens also published an article this evening about the sale of ClintonKaine.com.